Look at the picture below, isn't it nice? How would you like to spend your free time? Our neighbor own a boat and they always hang out on the river boating, fishing and just enjoy the view of Indian River and Banana River. I just realized that when we live in Mississippi, we live along the Gulf Coast facing the Gulf of Mexico. 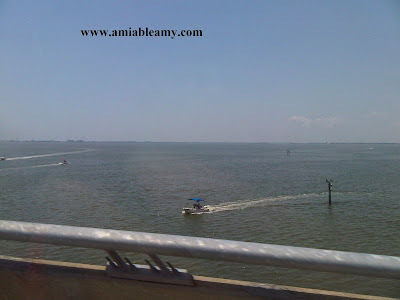 The picture below was taken at the Bay Bridge in Biloxi/Ocean Springs Mississippi. I have driven this road everyday from home to my work place. Now, we live near the beach in Florida facing the Atlantic Ocean. It is so beautiful out here and life is pretty laid back plus no heavy traffic at all if compared to Central Orlando. Here is the view of the road where we always pass by when we go to the beach area. We drove Indian River and Banana River before we hit Cocoa Beach area. Hubby and I used our old soft top tracker and just drive along US1 or A1A road and enjoy the cool breeze from the sea. When we get tired, we ate at the local seafood restaurants in the area and enjoys watching the cruise ship. Living along the beach area is quiet and simple. I also noticed that people here are more polite, friendly and family oriented. The last picture with the arrow, I was showing you the tiny object. I was laughing because my blackberry phone can only capture a small and fading picture of the space shuttle Discovery during it's final ride to the Smithsonian's National Air and Space Museum. We live few minutes away from Kennedy Space Center and on April 17, 2012, we watched as the shuttle Discovery ride at the back of the big Boeing aircraft --- off for retirement.